At Abbotsfield Dental, we continually evaluate the evidence behind our treatment protocols to ensure that you receive treatments which are scientifically proven to be effective. Our experienced group of dentists will ensure that you receive dental care and treatment that exceeds best practice protocols at all times. Dr. Yousif Chaaban was born and raised in Edmonton. He obtained his Bachelor of Science degree from the University of Alberta in 2000. Yousif then commenced to study dentistry at the University of Western Ontario and recieved his Doctor of Dental Surgery Degree with Distinction in 2004. 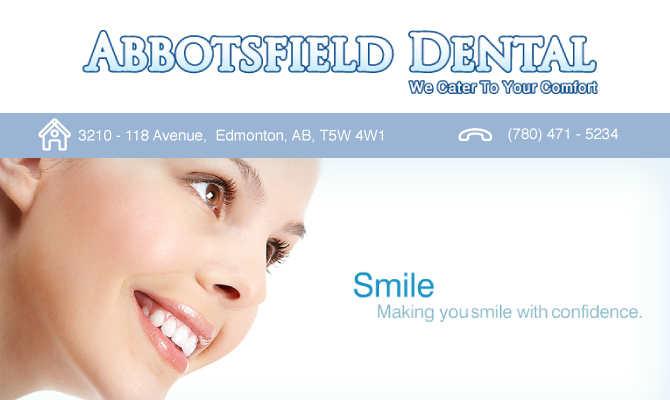 He strives to deliver efficent quality dental work and is dedicated to meticulous detail. His goal is to provide a friendly and comfortable environment for all patients and a stress-free dental experience; while not only providing regular checkups and cleanings on patients but also educating them on proper dental hygiene. In his down time Yousif enjoys traveling, as well as staying healthy through his love of hockey and fitness training. Dr. Bayan Hussein is from Edmonton Alberta and received both her Bachelor of Medical Sciences and her Doctor of Dental Surgery Degree from the University of Alberta. Her philosophy at work is to treat her patients exactly as she would want to be treated, and she is passionate about delivering top quality personalized dental care to each and every patient. Being a kid at heart, she has a special interest in pediatric dentistry and is committed to helping children, teenagers and adults keep an attractive, healthy smile for a lifetime. When she’s not working, Dr. Hussein enjoys spending time with friends and family, baking, camping, and travelling. Dr. Kelsey Syme was born and raised in Medicine Hat, Alberta. She attended the University of Alberta to complete her first degree in Immunology and infection. Prior to continuing her education, Kelsey spent time as a caregiver in a nursing home, working overseas and traveling the world for two years. On her return she attended the U of A to attain her degree in Dental Surgery in 2011. Kelsey enjoys getting to know her patients and aims to provide the best care possible for each and every one of them. With her focus on quality every patient of Kelsey’s is in good hands. In her spare time Kelsey enjoys hiking, camping, drawing, reading and travelling.